Today, Sonia Kruger - cohost on 'Today Extra' made a statement after the backlash from her comments yesterday during a segment on 'The Mixed Grill', on sister program the 'Today' show. A tearful Sonia Kruger explained what led her to call for a ban on Muslim immigration: she was 'rocked to the core' after seeing a photograph of a child's dead body in Nice last week. Her voice was emotional as she delivered a live statement at the beginning of her 'Today Extra' program on Tuesday morning. 'I saw the image of a baby covered in a plastic sheet with a doll lying beside her and it rocked me to the very core,' she said. She acknowledged that her call to end Muslim immigration to Australia may be seen as extreme, but has defended her right to voice her opinion after her comments on national television ignited a fierce national debate. ...She then opened up about the fallout from her comments that Muslims should be banned from Australia, and wasted no time in addressing the controversy this morning. Her comment yesterday on the Mixed Grill segment, in which Kruger called for Muslims to be banned from entering the country due to terrorism concerns, sent social media into a frenzy. 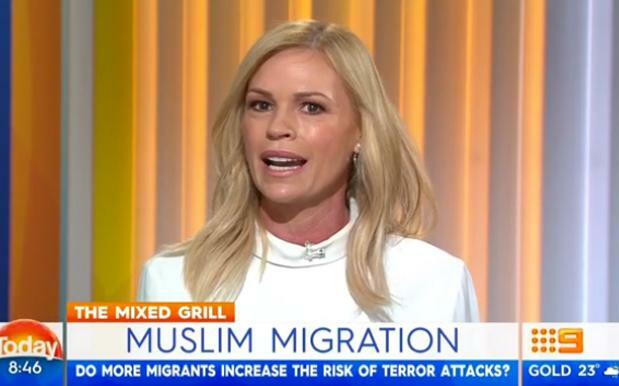 Today, Sonia Kruger read a prepared statement this morning on Today Extra, following her controversial comments yesterday calling for a ban on Muslim immigration. On yesterday's show, she said that while she had "peace-loving, beautiful Muslim friends", she was concerned about the number of Muslims entering Australia.